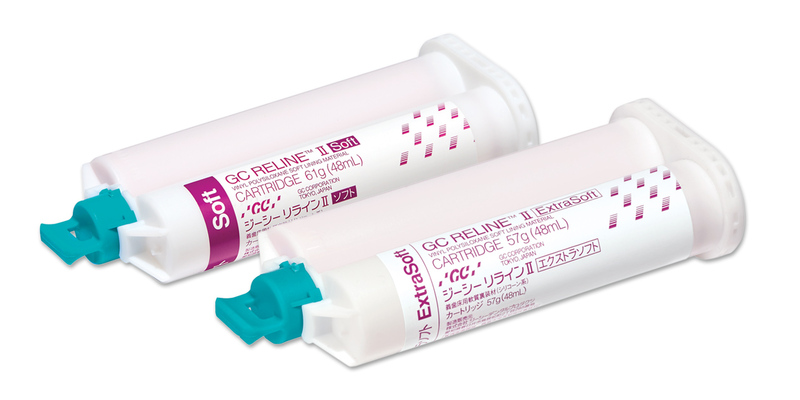 Cold-cure chairside relining material which has an improved vinyl polysiloxane formula that exhibits better adhesive characteristics and grinding performance in clinical practice. Automix cartridge uses DS 50, DS 74 guns marked 1:1/2:1 (same as impression material dispensing guns). Chairside VPS denture reline used to produce a soft, temporary liner. Contains: 1 x 61g (48ml) cartridge. VPS toning material used to provide denture bearing tissue with a more comfortable surface while the tissue returns to a healthy state. Contains: 1 x 57g (48ml) cartridge. Mixing tips have teal hub, clear barrel and white mixer.